A Pressey family history states that: George and His family sailed up the Saint Lawrence River and through Lake Ontario, until they arrived In Toronto. Here they were forced to leave the boat and go in a wagon from there to the shores of Lake Erie, where at Fort Erie, by this time their money was almost exhausted, they went by Ship once more on the last Lap of there Journey to Port Burwell, Bayham Twp., Elgin Co., Ontario, Canada. When George arrival at Port Burwell, which at that time contained only a few houses, their combined money amounted to but seventy-five cents. So far, it has been confirmed that the 1836 emigration brought the following Downton families into the settlement: James and Ann PRINCE; George, Mary, John and Eliza LIGHT, & William EDMONDS; Thomas and Sarah PRETTY; George and Mary PRESSEY; Some of the Bandy's; Thomas, ALLEN & Issac; Lucy DEARE. 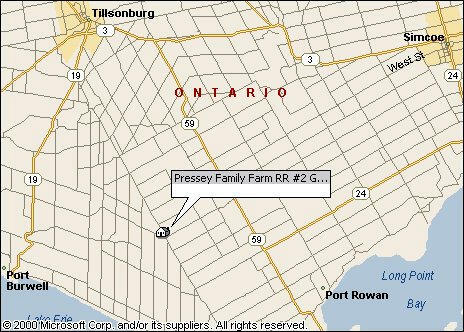 George Pressey and Family moved to the 3rd concession, lot 10, Bayham, Ontario in 1867. George later bought the south east quarter of lot 4 from Enos Pressey for $700.00 and built a log home, the remains of which are still standing on what is today RR#2 Glen Meyer, Ontario Canada, on the town Line between Walsingham and Houghton. John Pressey (is the 1st John in our files). James Chalk & Family were also on the Ship Louise. The Louise Landed in New York. From there to Pennsylvania, This is the storey as told by Hanna Rose (Grant) Pressey (MY Grandmother): John and family were asked to leave Pennsylvania USA (because they supported or were Loyalist) (In 1835, James Chalk and John Pressey heard about Colonel Talbot, and the Land Given for Settling, Before they Left England.) and were put on a boat with only the clothes on their back and one cow. Arriving Port Burwell, Bayham Township, Elgin County, Ontario, Canada, 3 miles West of Vienna, Bayham Twp., Elgin Co., Ontario, where the cow was held by customs until the duty of $15.00 was paid. And another story had John & Son George ((a Strapping 16 year old), crossing at Buffalo and making there way to Port Burwell. Now whether they crossed at Buffalo, or were sent across Lake Erie. Still needs to be determined. However From the Information I have found so far It looks like they where sent from Pennsylvania across Lake Erie. 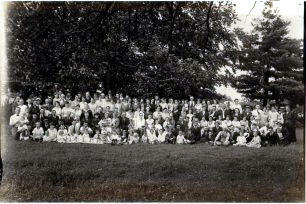 They arrived in Port Burwell, Canada, About 1846.